Our new Night Reader's soft red glow gives enough light to read a star chart at night without destroying your night vision. 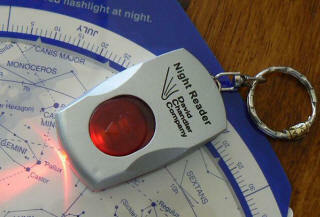 The Night Reader is easy to use, easy on batteries, and easy on your eyes. Price List and Order Form in Adobe PDF format. It's easy to use your credit card to order from AstroMax. Just click on the price of the item you want, and your order will be processed by CCNow, our online retailer. Click HERE to download our Price List and Order Form in Adobe PDF format. Click HERE to add an additional $25.00 for Air Mail Postage on OVERSEAS SHIPMENT of Telescope and Binocular orders. AstroMax ships all orders via US Postal Service Priority Mail, assuring you delivery within 2-3 business days from the time we receive notification of your order from CCNow. When you order online through CCNow, $5.00 for postage and delivery confirmation will be added to your total order, a higher amount for Canadian and overseas shipments. An additional amount for shipping and handling will be included in the base price of the telescope and binocular kits, due to the extra weight and size of these items. CCNow will respond to your question within one business day.